The seed of the palm tree, coco de mer, is the largest seed in the world. It can be 12 inches long, and weigh up to 40 pounds! 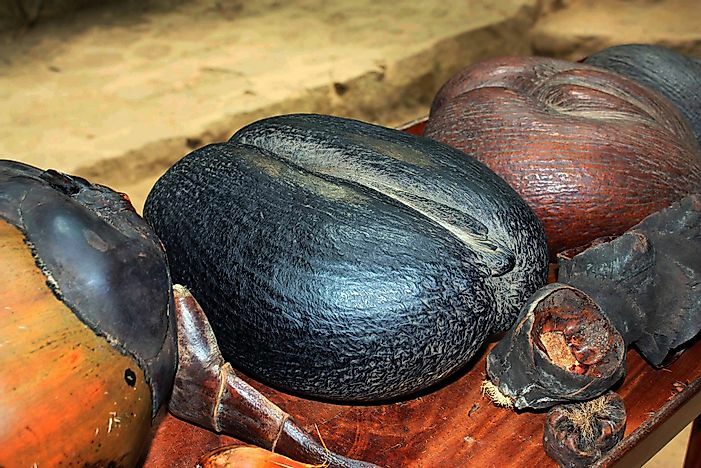 The coco de mer seed is the largest seed in the world. A seed is a germinal plant enclosed in a protective outer covering. Seeds are the result of plant reproduction. A seed is formed when an ovule becomes ripe after fertilization by pollination and develops within the mother plant. Most seeds are dry fruits, and different types of plants have different seeds ranging in size, texture, type, appearance, and shape. Seeds play a crucial role in the reproduction of plants. Coco de mer (Lodoicea maldivica) is also known as double coconut or sea coconut. Coco de mer is an endemic plant species to the Curieuse and Praslin Islands of the Seychelles. The plant was found in other regions near the Praslin Island but became extinct until recently when it was reintroduced. The fruit of the coco de mer plant is the largest wild fruit in the world, weighing about 93 pounds. It also produces the world's largest mature seed, weighing about 40 pounds. Upon fertilization, the coco de mer seed produces the longest cotyledon measuring up to 13 feet long. The coconut tree (Cocos nucifera) is the only plant species of the Cocos genus. The coconut plant has the second largest seed in the world. The term coconut can be used to mean the seed, fruit or the entire plant. Coconut fruits are best known for many traditional applications including cosmetics and food. The coconut seed is made up three layers, the exocarp, mesocarp, and endocarp. The two outer layers make up the coconut's husk, and the mesocarp consists of many fibers known as coir which are used for many commercial and traditional purposes. The seed's shell has germination pores that are visible when the husk is detached. East Indies Palmyra (Borassus sundaicus) is a plant species indigenous to Southeast Asia and the subcontinent of India including Cambodia, Sri Lanka, Thailand, Bangladesh, Vietnam, Nepal, Malaysia, Burma, Philippines, Laos, and Indonesia. The plant is believed to have spread to parts of China, Socotra, and Pakistan. Each fruit contains one to three seeds which are confined inside a woody endocarp. The plant's fruit has a diameter ranging from 3.9 to 7.1 inches in diameter producing the fourth largest seeds in the world. The Caroline ivory palm (Metroxylon amicarum) is a flowering plant species endemic to the islands of Caroline. The Caroline ivory palm is the only plant species in the Metroxylon genus which flowers only once in its lifetime before subsequently dying. The Caroline ivory palm produces fruits 3.5 inches long with a single seed enclosed in the endocarp. This plant, whose seed is the sixth largest in the world, is only found in the Federated Micronesian States. As the plant is cold resistant, its greatest threat is habitat loss. Muli is also known as the Chittagong forest bamboo and scientifically known as Melocanna baccifera. The plant is one of the two species of bamboo which belong to the genus Melocanna. Muli is indigenous to India, Thailand, Myanmar, and Bangladesh. The Muli plant produces the seventh largest seeds in the world. Human life is highly dependable on plants for all the commodities they provide including food and medicine. Many seeds provide essential nutrients needed by the human body. Seeds are the fundamental foundation of human diet and have high medicinal and curative properties.